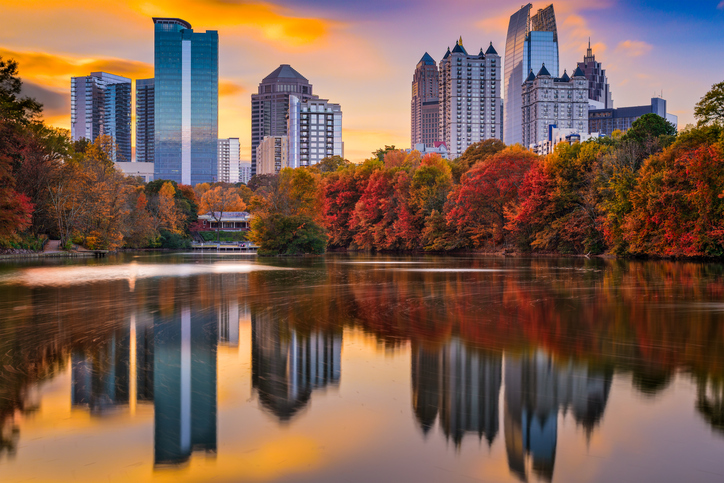 With hot summers and mild winters, Atlanta is an outdoor playground of must-visit attractions. There’s always a live concert in this 21-acre urban oasis, making it ideal for a wonderful day out with friends and family. The park’s concert series “Music at Noon” and “Wednesday WindDown” feature blues, jazz, and R&B performances by the best local artists. Seasonal events like the 4th of July Celebration and Holiday in Lights also take place here throughout the year. The Fountain of Rings is the park centerpiece, renowned for being one of the largest interactive fountains in the world. Stick around for the synchronized water and music program with brilliant lighting effects. Located just a mile from downtown, this urban park offers a stunning view of the Atlanta skyline. Make it a must-stop during the fall, when the trees change color. Sit by the lake, watch ducks float by, and admire the russet foliage. There are plenty of open spaces where kids can roam and play. Needless to say, visiting Piedmont Park is one of the favorite things locals do in Atlanta. Bring your board and hit the ramps in Atlanta’s first public skatepark. Its grand opening in 2011 was attended by no less than Tony Hawk, whose foundation contributed $25,000 to the facility. Watch other skaters do tricks and learn a thing or two from the pros. The park also has other features, such as open spaces and a multipurpose athletic field. It also makes use of green technology, such as solar panels, to help offset the park’s energy consumption. Explore 22 miles of trails on foot or by bicycle at the Atlanta Beltline. It’s a pet-friendly outdoor attraction, so bring your dog. It also features several art installations, which you’ll spot at different points along the trails. The Historic Fourth Ward Skatepark is located right on the beltline, so do a little side trip and skate to your heart’s content. This upscale outdoor reception area is the ideal place to hold pre-concert get-togethers and other special events. It can accommodate groups of 20 and up to 225 persons. The smoke-free facility is a great place to relax and catch up with friends after a long week at work. At 30 acres, the garden is home to the Fuqua Orchid Center, where you’ll find a vast collection of vividly colored, high-elevation orchids. It’s also home to the Kendeda Canopy Walk, which lets you walk among the treetops and learn about native plants. There’s a large playground where kids can play in the Sunflower Fountain. This family attraction spans 3,200 acres across Atlanta’s gorgeous terrain. Play games, explore the rides, and watch the spectacular Lasershow featuring lights, lasers, fire effects, and drones. The amusement park hosts dozens of seasonal events, the most popular of which are their Halloween and Christmas celebrations. There’s something for every member of the family in this theme park located just west of Atlanta. From thrill rides like roller coasters to kid-friendly rides like the carousel, Six Flags caters to visitors of all ages. Explore the arcades, try the restaurants, and catch a live performance. Ask us about real estate opportunities in Atlanta today. Call Natalie Gregory SOLD at 404-373-0076 or send an email to Natalie(dotted)Gregory(at)Compass(dotted)com for more information.